The Memorial Gates were erected to commemorate those who served in World War One. Commemoration of Anzac day took the form of a memorial service in Victory Park today. Included in the large assemblage were several hundred school children. The impressive service was conducted by the clergymen of the town, and the occasional address, was delivered by Rev. I. Hopkins. 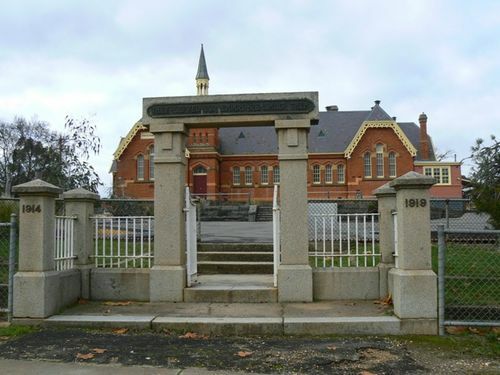 Memorial gates erected by the North Castlemaine State school, at a cost of over £200, were dedicated this afternoon by Rev. H. W. G. Nichols, and were officially opened by Mr. Hurry, M.P. Ninety-five past pupils of the school served in the great war, 39 of whom died. The ceremony was performed in the presence of a large assembly, and in addition to Mr. Hurry, Mr. Groom, Federal Attorney-General, and Mr. C. R. Lowe, delivered appropriate addresses. The school children subsequently marched through the gateway, constructed of Harcourt granite and iron, and saluted a new flag, which had that day been presented to the school by one of the parents. Age (Melbourne), 26 April 1923.